On my way to the breakfast treat of our office, while on the jeepney, the wanderlust in me had been awaken. In response to this, I texted May if she wanted to visit Paco park. A little part on my hippocampus told me that she wanted to go there. And apparently, I'm in need of interesting subjects for testing the replacement of my camera lens that broke during my Corregidor trip two months ago. Around 11am, from West gate, we walked to Town where the bus stop is located. Bus ride via Coastal road. then touchdown, City of Manila. Photos taken at Paco Park. Small Chapel at the center of the Park which had been a Cemetery before. Notice the niches on the photo above. 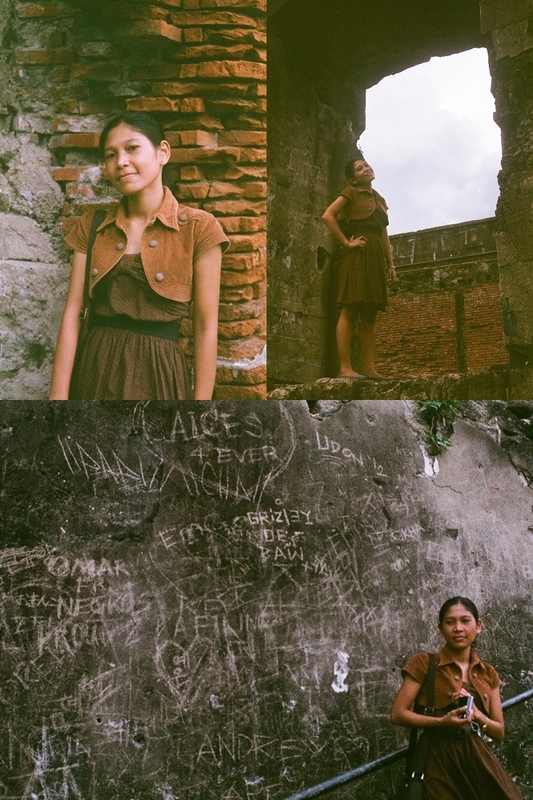 my model for a day :) I love how her dress matches those brick walls. Here I go again with the rustic color scheme fascination. Did a lot of walking that day (Oh What's new, Sar?) which I think is good after a week of seating inside the four-walled space. Ended the day with a a fast food dinner. I've been eating "fake foods" lately. Tiring but well-spent day. 'Til the next walking adventure.